I have not read many books about either dragons or the decedents of dragons. The idea interests me greatly, so when I came across Firelight I decided to give it a try. It had some issues, but overall it was a good book with an interesting backstory and plot. Jacinda is the only fire-breathing dragon in generations. Her future has been mapped out for her from now until the end. In an act of rebellion and defiance, she flies during the day and is spotted by hunters. In her attempt to flee from them, she ends up trapped but meets Will for the first time. A series of events unfold and soon she and her mother and sister are on the run from the pride. She feels entirely out of place at the new school, until she crosses paths with Will again. For some unknown reason he both calms and excites her, putting herself, her family, and Will in danger. Jacinda was an interesting character. She had good and bad traits, which I liked. I like when characters come across as real people. The dynamic between her and her family was really fascinated me. I think the entire family could benefit from sitting down and just hashing things out. There’s a lot of frustration and disappointment that stems from a lack of understanding from everyone. Jacinda can’t understand why her mother turned away from her draki side, why her sister can’t understand how hard it is for her living away from the pride. But on the flip side, Jacinda doesn’t try to understand their points of view very well. There were a few issues I had with the book. I wish the dragon world was set up a bit more, maybe a little more background given or have the pride fleshed out a little. It didn’t really take away from the story; I just wish it had been included. Another issue I had was how quickly Jacinda and Will declared they were in love. It’s just difficult for me to believe that without being together for very long, love has blossomed. Maybe that’s just a personal thing with me, but I’d always rather have characters admit attraction and strong feelings instead of calling it love. 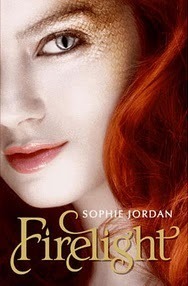 Firelight is one of the few books I’ve found that has a dragon understory and is a good read. The story is unique and has a lot of promise. I’m looking forward to reading what comes next for Jacinda and Will. This entry was posted in Something a Little Different, Young (and New) Adult and tagged Fantasy, Paranormal, Sophie Jordan, Supernatural, Young Adult.